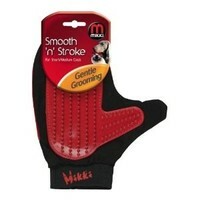 Mikki Smooth and Stroke Grooming Mit for Short/Medium Coats offers a gentle, kind way to groom your pet, a great alternative to combs and brushes for nervous animals. The rubber side of the mit remove loose hair whilst gently massaging the skin simultaneously. The smooth, velvety side of the mit polish your pet's coat, leaving it glossy and shiny. This product is perfect for short coated cats and dogs and other animals.